The button Advanced opens the Advanced Options Dialog. In the dialog tab DDL/DML Options you can tell SQLyog how to behave if it finds resembling data at your MySQL destination. SQLyog's import external data provides you with the following options to import data from the source. Drop And Recreate, to have the existing table completely replaced. Update With Source, to have the existing data completely replaced. Keep Target Data, to have the existing data kept as it is. Abort, to skip importing the table if duplicate records are found and proceed to the following tables. All rows already imported to the table will be kept. Abort, to skip importing the table if the similar one already exists and proceed to the following one. There is also the 'Table type' setting where you should specify a storage engine type for new tables created by Import tool. Note, that if you want to import foreign keys you must select an ENGINE supporting such. InnoDB and some 3rd party ENGINES (like PBXT) have this option. 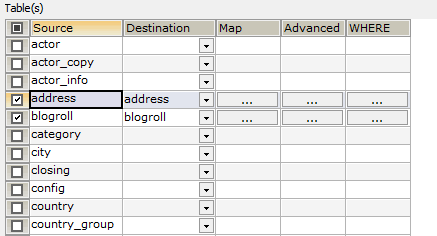 If you just need the table structure to be created, check the option Import table structure only. Below that, you can indicate if you wish to import FKs ( Import Foreign keys) and other indexes (Import Index) defined for the source tables. Note that if you select to import FKs, other indexes will be automatically imported as well. Apply changes to all tables: When this option is selected, same import settings will be applied to all tables in one operation. 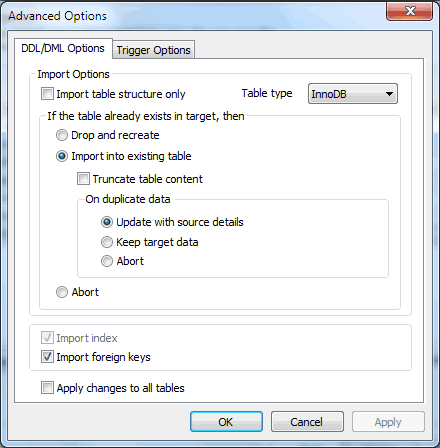 At the Advanced Option Dialog's tab Trigger Options you can setup SQLyog's powerful feature: Triggers on import source.